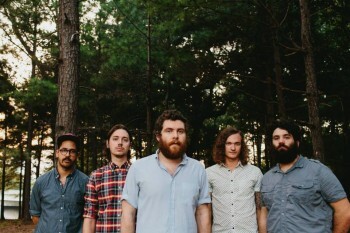 “It’s nice to be back in our hometown”, are the first words we can hear from Manchester Orchestra after a couple of songs, in a marvellous night where the Atlanta-based quintet introduce their brand new album Cope. The indie-rock outfit grew out of songs that singer and songwriter Andy Hull had begun writing during his time in high school. They started as a trio and recorded an EP edited on their own label Favourite Gentlemen Recordings, and began playing around the southeast of the United States. In 2006, their debut album I’m Like A Virgin Losing A Child was released and got many great reviews, followed by an increase of their popularity. Cope is their fourth LP and probably their most intense and heavy album. They abandon those quiet and melancholic moments from their previous releases as crunched guitars with hammered drums appear along these 11 tracks. Tonight we are hoping to enjoy those songs played live, but it seems that Manchester Orchestra prefer to show us their classic compositions first. They open with ‘Shake It Out’, followed by the happy indie-pop melodies of ‘Pensacola’ and the crowd starts to sing loudly with them during those catchy choruses. Most of the band’s works are lo-fi pieces, easy-listening pop songs that become powerful played live, which is one of their most considerable achievements. Throughout the whole recital, Hull plays the main character on the stage with a very personal soft voice that is the main characteristic of the band. Halfway through the show it’s time for ‘The Ocean’, the first new song of the gig, and curiously it doesn’t sound as powerful as in the album. The same thing happens with ‘Cope’ and ‘Top Notch’ so it looks like they may need more time to set these songs for concerts. Anyway, that just means a small gap in a great night at the Club Academy, because the party is not over and classics like ‘I’ve Got Friends’ and ‘Everything To Nothing’ make people start to jump and push themselves. After a few minutes of break, the Georgia quintet take the stage again for the final round. ‘Simple Math’, probably the band’s most famous song, is sounding great a few moments before they close the night calmly with ‘Where Have You Been’. Of all the new tracks played tonight, ‘Every Stone’ sounds the best, but the night really belongs to the classic material taken from Mean Everything to Nothing and Simple Math. Let’s hope next time they visit us again (which is going to be on the 1st of October) we can enjoy more new songs played live.